This year, I have challenged myself to join Amy Johnson Crow's Challenge - 52 Ancestors in 52 Weeks. Hopefully this will provide me with incentive to put pen to paper and write a few more family stories. As we are already into the third week of 2015, I am a little late getting started, however the plan is to to catch up over the next couple of weeks. This challenge will not only give me the motivation to research family members further, but also help me to connect with other researchers who may be connected and researching the same family members. It is my experience that a story shared inevitably links you with other family members. Over the next 12 months I plan to split my 52 ancestor stories over my two blogs, Family Stories, Photographs and Memories, and this blog, The other half of my tree, stories of my female ancestors. Keeping with the theme "a fresh start" I have chosen to write about my husbands great great grandmother, Barbara Martin (1827-1902). Barbara was the second child of Adam and Janet Martin, and was born in the Scottish moorland village of Carnwath, Lanarkshire, Scotland in March 1827. 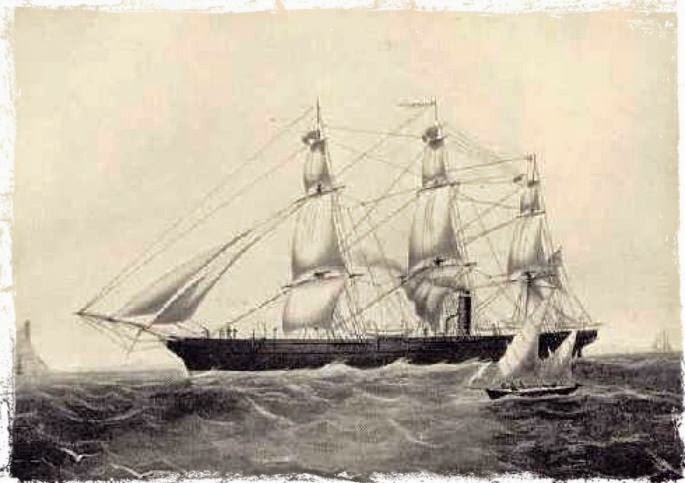 The journey from Greenock Scotland to Hobart, Tasmania, Australia in 1855 on the "John Bell" was most certainly a fresh start for Barbara and her family. 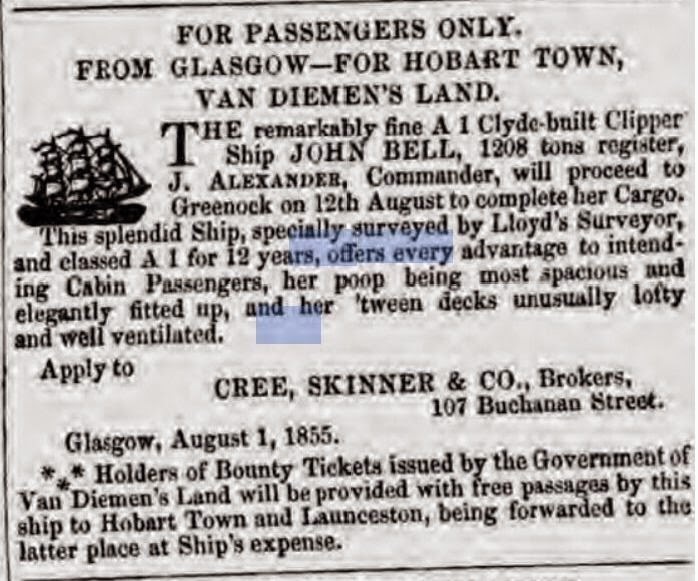 Barbara's parents Adam Martin (1800-1875) and Janet Russell (1801-1879), along with her siblings, immigrated to Tasmania as part of the Bounty Ticket System. The Martin Family, included parents Adam and Janet, children Thomas, Barbara, Adam, Margaret, Janet and Jane (ages ranged between 28 and 14 years of age) left Scotland arriving in December of 1855. Their bounty fare of 22 pounds each was paid in total by a Mr John Walker. The Martin Family settled in the rich rural area of New Norfolk Area of Tasmania. Barbara met and married Joseph Smith on the 28 March 1859, and continued to live in the New Norfolk district. They had five children, Janet, Robert, Margaret, Thomas and my husbands great grandfather William Joseph. Prior to 1888, Barbara's son William moved to Sydney, New South Wales and married Elizabeth Sixsmith. It is quite possible that Barbara and Joseph Smith moved to Sydney around the same time as William as Joseph is listed as one of the witnesses on his marriage certificate. It has been difficult to discover the latter events in Barbara life, though we do know from her death certificate she spent the last twenty years of her life living in New South Wales. On the first of February 1902 Barbara passed away at the age of 74. 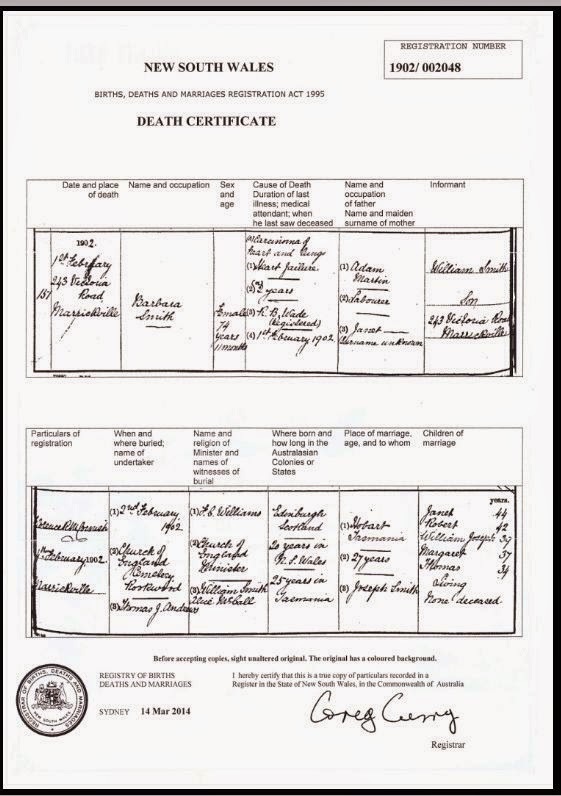 Her death certificate states that she was living with her son William in Victoria Road, Marrickville. Though there are still many gaps in Barbara's story, you would definitely have to agree that her story fits well into the "fresh start" category and that in her 74 years she had certainly seen and experienced a full and eventful life. A great start to a challenging year! By the way, I think you mean Greenock, not Greenoch. Oops, thanks for picking up the spelling mistake, shall correct it.